The Samsung Galaxy Note is a pretty big device – 5.3 inches big. The Dell Streak was 5 inches and I still thought it was pushing the lines of a tablet. href=”http://www.samsung.com/” rel=”homepage” target=”_blank” title=”Samsung”>Samsung realizes that with the huge display and all the screen real estate they could have done some things better. One of those things, of course is keyboard use. I can’t tell you how many times I type with one hand when I need to get a short message out. Some like to text while driving (bad idea, by the way), some might eat/drink and text and others simply just don’t want to use their second hand (humans are lazy). A new update for the device brings tweaks to the keyboard that those folks should enjoy. 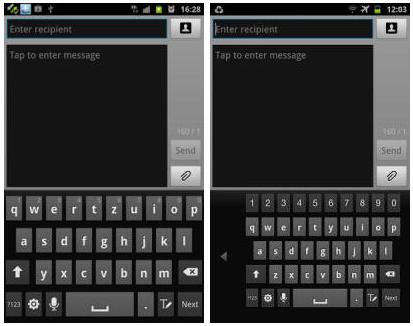 The keyboard can be aligned to the left or right of the screen and it has been shrinked for comfortable one-thumb use. The dialpad can also be used in this way. They’ve also added a dedicated number row to the keyboard – might as well make use of all that real estate. Other minor tweaks have been made to href=”http://en.wikipedia.org/wiki/TouchWiz” rel=”wikipedia” target=”_blank” title=”TouchWiz”>TouchWiz, as well, such as the lockscreen unlocking mechanism. Before, there was a large pane you had to swipe away (a tiring motion for a phone this big). Now you get more of an Ice Cream Sandwich-style unlock so you won’t have to move your finger far to get to your homescreen. The browser has gotten some tweaks and Samsung’s included a torch app for using the LED as a flashlight. Users with unbranded phones in Europe should start seeing the update over-the-air. Be sure to enable WiFi before downloading it because you’ll be eating up 70MB of bandwidth. Find more photos over at The Unwired.